◎ The new work report requirement for Politburo members clearly sets Xi above the rest of the Politburo Standing Committee. 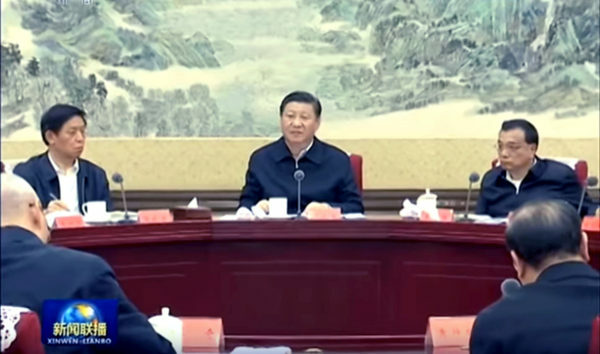 The Chinese Communist Party’s (CCP) 19th Politburo emphasized Xi Jinping’s status as Party “core” leader and passed two regulations during a meeting on Oct. 27. According to one of the regulations, which called for the strengthening and protection of a unified Party leadership, all Politburo members and those on its Standing Committee are required to submit a work report to General Secretary Xi every year. Why it matters: The new regulation confirms that Xi’s status in the top CCP leadership has been elevated. Before the 19th Party Congress, the CCP’s rule by a collective leadership restricted the status of the General Secretary, the top CCP leader, to being merely first among equals in the Politburo Standing Committee. For example, the General Secretary and the six other Standing Committee members can only cast one ballot when voting on key policies and decision. But the new work report requirement for Politburo members clearly sets Xi above the rest. During the horse-trading before the 19th Congress, Xi likely gave up his demand for Wang to remain in the Politburo Standing Committee so that he could add a political theory bearing his name into the CCP constitution. Also, Xi had to retain the collective leadership model and not implement a Chairman system. However, Xi now appears to be using Party internal regulations to boost his status and authority to that of a CCP Chairman. “Xi Jinping Thought” may be written into the constitution, but titles alone don’t automatically grant power to a Chinese leader. Xi will likely seek to embellish his authority through propaganda and the formulation of internal rules. The outcome of the 19th Congress indicates that the Jiang Zemin faction still has some strength left and will keep striving to undermine the Xi leadership.